The impressive growth of the e-Commerce industry in the recent times have encouraged many retail behemoths to start e-Commerce outlets in order to expand their customer base worldwide. 2014 seemed a promising year for the online retailers as sales catapulted to $840 billion (more than 20%), encouraging them to explore more potential and promising markets globally. Currently, the United States boasts of the largest e-Commerce market, followed by China, United Kingdom, Japan, Germany, France and South Korea. 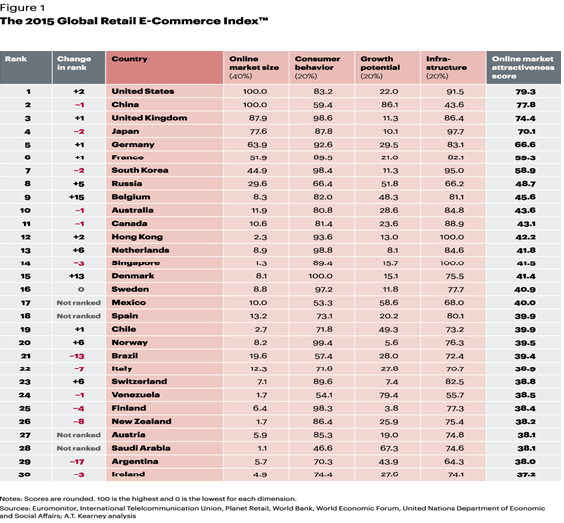 The 2015 Global Retail E-Commerce Index depicts the growth rate of the ecommerce industry in the top 30 countries. The recent boom in the e-Commerce industry has brought forth challenges for both the brick-and-mortar leaders and the online players. The brick and mortar stalwarts are realising that the future does not lie in consolidating their position in the physical markets, they need to establish their presence online. Similarly, the ecommerce behemoths are seamlessly setting up offline stores. Walmart and Nordstrom are expanding their online offerings, whereas US-based Amazon and Singapore’s Zalora are already stepping into the physical markets, offering offline set ups to prove to be big winners in the industry. In the United States, the ecommerce market has gained greater momentum and customer confidence since 2014. The United States based e-commerce is predicted to reach $350 billion in sales by end of 2015. E-commerce is gaining momentum in Europe. According to a recent study conducted by The RetailMeNot, Inc., sales in the United Kingdom, France, Italy, Germany, The Netherlands, Poland, Sweden and Spain are expected to escalate from £132.05 billion in 2014 and reach £185.44 billion in 2016. In 2015, overall online sales are expected to grow by 18.4% (same as 2014) with 13.8% in the United States on a much larger total. The Asia Pacific ecommerce market continues to expand, however, there have been some dips in 2015. 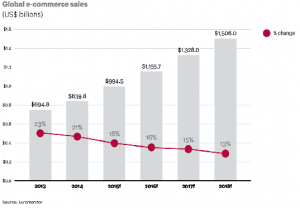 The ecommerce market has expanded in China, but it has also seen dips with growth rates slowing down at times. The growth rate has also slowed down in South Korea, which, according to the 2015 Global Retail E-Commerce Index, has dropped to 7th place, down from 5th in 2013. The e-Commerce industry is developing in India; however, there is still time when the country will be at par with their US and UK counterparts. The ecommerce industry in India has increased by 27 percent in 2014 and is expected to grow 21 percent over the next 5 years with Amazon announcing a $2 billion infrastructure investment in July. Flipkart has also made announcements of raising $1 billion in capital, and it is expected to maintain its position as the second-largest retail ecommerce market in 2018, totalling to $500 billion( approx.) in that year. In 2015, the global ecommerce sales will increase nearly by 21.0%, plummeting to amount of $1.592 trillion approximately. In 2016, the sales is expected to grow by 18.6%, amounting to $1.888 trillion. Two countries that are expected to contribute maximum revenue in the ecommerce market are the United States and China. The European countries are expected to contribute their lot in the ecommerce industry. The UK ecommerce industry is expected to reach 61.84 billion euros in 2015. In Germany, the industry will be probably reach 52.79 billion euros and in France, ecommerce sales will touch 36.53 billion euros. 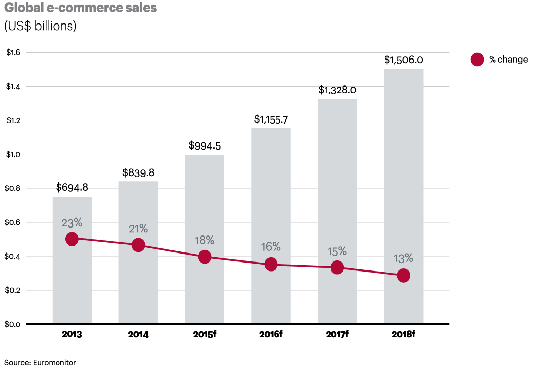 The chart below depicts the global ecommerce sales in the upcoming years. The global retail sales are set to increase, although the growth will be slower. With the ecommerce industry expanding rapidly, the pricing strategy has quickly become a vital aspect of online retail strategy. The application of dynamic pricing solutions and price intelligence is on the rise. Many ecommerce retail giants are utilizing the art of price technology to increase their profit margin. Basically, ecommerce platforms enable online retailers to optimize the prices of the products based on advanced pricing rules to withstand the competition and price profitability. Most ecommerce retail giants these days are implementing dynamic pricing strategy that includes competitive monitoring. Pricing is the most significant component of brand perception. Therefore, eCommerce retailers must maintain flexibility while determining the prices of the products. Most eCommerce retailers benchmark their pricing decision using Price Monitoring Solutions, which enables them to monitor competitor’s product pricing , track competitive products, optimize product variations, monitor promotions, check profitable products, set automated pricing and repricing, position the product in comparison with similar products in the market and improve pricing strategy. A price monitoring software that can provide complete visibility into competitor’s pricing and product variations is most sought-after in the eCommerce industry. It enables online retailers to make profitable pricing decisions. The fact is e-Commerce industry is developing rapidly. With the increase of the online shoppers, one can expect an amazing outcome in the profit level in the upcoming years. Pricing decisions can have a significant impact on the business. Therefore, it is vital for any business to respond to new forms of technology, such as using smart price monitoring software to provide the best pricing and reap benefits in the future. Share the post "The eCommerce Industry & the Price Game"